You are viewing the archived 2016 toilet paper ratings. Follow the link to view the current toilet paper ratings. Where can you find the best toilet paper? You can start by comparing brands with our customer review and ratings. Coles has retained its place at the top of our ratings table for toilet paper. But this year Coles So Soft is joined by ALDi Confidence as the two highest rated brands. When it comes to toilet paper, consumers have traditionally had two choices – the cheap and nasty, or the expensive and quality. It’s often the case that ‘you get what you pay for’ and this has historically been true with toilet paper. However, with Australia’s big supermarkets placing more emphasis on private label products than ever before, picking up a ‘cheap’ pack of toilet paper doesn’t necessarily mean you’re buying an inferior product. Likewise, buying the most expensive brands doesn’t always mean you’re getting the best value for money. Step forward ALDI Confidence and Coles So Soft – two supermarket private label brands that have topped our customer satisfaction ratings for toilet paper in 2016. For Coles So Soft, it is the second year in a row at the top of these ratings, while ALDI Confidence has improved from four stars to five for overall satisfaction. Coles’ cheaper toilet paper alternative, Smart Buy, received three stars overall. It was also three stars for Woolworths’ cheapest toilet paper, Homebrand, while its premium private label Select brand earned four stars overall. ALDI Confidence is the only brand to receive a five-star review on value for money this year, while Coles So Soft is one of just three brands to score top marks on strength and quality – the others being Emporia and Quilton, winner of our 2014 ratings. Australians are split down the middle between those who simply buy whichever toilet paper happens to be cheapest on a given day or is perceived to be the best quality, and those who take the tried and tested approach, always going back for the same brand. Our survey found that just under half of consumers (48%) always buy the same brand of toilet paper, but which brand has the most loyal customers? The survey, of more than 5,000 shoppers conducted in October and November 2016, found that those who purchased Woolworths Homebrand toilet paper are the most likely to always buy the same brand (67%), followed by those who bought Naturale (61%) and Quilton (56%). ALDI Confidence was not far behind at 54%, while the number was 40% of those who bought Coles So Soft – slightly lower than 45% for Coles Smart Buy and 46% for Woolworths Select. Those who bought Purex (26%) or Emporia (30%) were found to be least likely to always buy the same brand. 76% of men try to make life easier for their partner by leaving the toilet seat down, while 43% of women attempt to return the favour by leaving the toilet seat up. Two-thirds of Australians (66%) fold their toilet paper, while 28% prefer to scrunch it up, and the remaining 6% are not sure what they do. One-third of Aussies (33%) take their mobile phone with them to the toilet, and 11% have accidently dropped their phone in the toilet. Whatever your preferred brand of toilet paper, or toilet-going habits, we hope you enjoyed reading this article… perhaps, indeed, on the toilet! 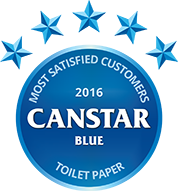 Canstar Blue commissioned Colmar Brunton to survey 6,000 Australian adults across a range of categories to measure and track customer satisfaction. The outcomes reported are the results from customers within the survey group who have purchased toilet paper in the last month – in this case, 5,116 people.